Celeriac is a member of the celery family. Its flavour is similar to that of celery and parsley, so you will often see it recommended as a substitute for celery. Perhaps for this reason, it is also known as celery root. Celeriac is not a vegetable that frequents my kitchen. I may have cooked with it perhaps 4 or 5 times, as a soup, as mash, in a stew and even as a remoulade, but that’s as far as my celeriac cooking repertoire goes. I have also tried growing this Medusa looking vegetable, but without success much success. The knobbly roots grow, but not the bulbous root itself. I think it is because I have not prepared the soil well. When I get a larger plot in the future, I may try growing them again. 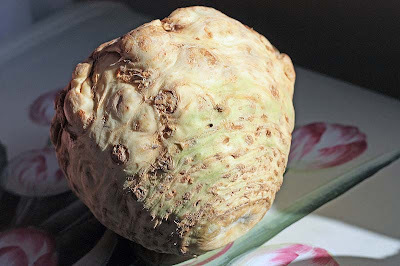 Anyway, this celeriac grown somewhere in England was either going to be transformed into another soup or roasted with other winter root vegetables, but I changed my mind when I came across Demuths recipe for celeriac burgers. I haven’t altered the recipe too much, barely in fact. The only thing different was my celeriac weighed a bit more, so I was able to make 6 large burgers instead of four. If I was to eat out and be served these burgers, I would be ever so delighted. Unfortunately, most places sell processed carpet tile like burgers, or those vegetable ones that are robotically shaped into discs. This vegetarian burger has echoes of celeriac remoulade and the horseradish was a wonderful warming touch. I personally prefer horseradish sauce to mustard, which I find harsh. On frying and flipping over they held very well too, whereas some vegetarian burger recipes just fall apart. I am submitting this to Professor Kitty of The Cabinet of Prof Kitty for Weekend Herb Blogging #228. WHB is a weekly blog event originally started by Kalyn. It is now coordinated by Haalo. This is wonderful food event for bloggers to showcase ways to use different vegetables, herbs, spices and fruit. Gently sauté the celeriac and garlic in the sunflower oil until softened. In a large bowl combine the celeriac mix with the mashed black eye beans, spring onion, breadcrumbs, parsley and horseradish sauce. Season well. 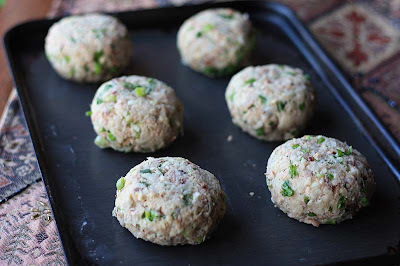 Shape into 4 -6 burgers and place in fridge for 30 minutes to firm up before frying. Fry on both sides in a little sunflower oil until golden. Serve in a bun with crispy green leave, and red onion. Adapted very slightly from Rachel Demuths Green Seasons Cookbook. Your so welcome Frugal. And Thank you so much. You are so welcome and I am so glad you like it. If you decide to make these for your little ones, you may want to reduce the horseradish, it may be a tad hot for young tongues. I love celeriac, cooked in almost any way - thanks for the recipe! Those look great and flavours I wouldn't have thought to put in a burger. I bought some homemade spicy ketchup at the farmer's market at the weekend, so I have been thinking about making some burgers to use it with. Thanks for stopping by my humble little blog and leaving such a nice comment, I love visitors! These burgers look so good, I need to try it ASAP! What a great recipe for celeriac. I love it, but really only mash it with butter. Thanks for adding some variety. Is it very pricey in the UK? Celeriac is quite expensive here in the States. I hear that in Romania they practically give it away. Hm. These sounds good, I may have to try a variation of them without the horseradish, my husband hates celeriac and i'm forever trying to find ways to cook it so he'll like it...my ongoing mission to get him to like all veg! I've never tried celeriac, but this recipe sounds delicious. Thanks for sharing, I tried growing this last year but with very little success. But this recipe will give me courage to buy the vegetable and try using more at home. Your cooking sounds as adventurous as it does delicious. You don't do housecalls do you? I ADORE celeriac - thanks for this one, Mango. I recently read a recipe for a celeriac lasagne - and now, for the life of me, can't remember where I saw it. I tried to grow these knobbly creatures too, but I think my London clay soil defeated them. To all my reader, if you don't have this cookbook. I do recommend it. I think its real homely food. Just the kind I like the make. I'd recommend not using the red sauce for this one, unlike other burgers that do need the flavour disguising, this one just needs some mayo or perhaps more horseradish. Please trust me, the sauce will kill the real flavour and you don't want to do that to a good burger. Celeriac is certainly different. I think its a gentle root vegetable, esp in flavour if not the peeling and chopping. Thank you for repaying hte compliment beautiful Chilean woman. I agree Jen S. It is a great recipe for celeriac. Yeah I would say it is a little pricey probably because people are still unfamiliar with it, and you don't see it that often either. I actually bought this one at a reduced price (thrifty me) as it was reaching its sell by date. Mmm practically giving them away in Romania you say, I wonder why?! I agree these celeriac burgers are pretty original. I couldn't find anything like it on the web or in other cookbooks. I would encourage you to next time make these instead of a soup! They were very good. You could perhaps sub the horseradish with vegan mayo and a touch of mustard. I am quite surprised to learn that you husband hates celeriac, its not a veg you see that often :D Have you tried roasting it and then drizzling it with coriander pesto. Roasted veg always wins hearts! Please do try celeriac, its quite mild in flavour. You are absolutely welcome Fran. Oh Fran you've excited me the idea of celeriac lasagne, when you locate where you saw it, you must make it and share it with us all. Sorry to read that you haven't been successful growing this knobbly veg. I wonder if any of my readers have been able to grow it well?! These burgers were really delightful. Please do try the recipe. I've had a tin of black eyed beans sitting in my cabinet for months, its destiny, undetermined. Now I know what to do. This recipe looks fabulous. I've generally had good luck with Demuth's recipes. Speaking of which, in case you didn't read on my blog, I'm going to her cooking course in France this May and will be blogging more of her recipes. So stay tuned! I look forward to reading about your course at Demuths Cookery School. I have never been on a cookery course so am always keen to read about other peoples experiences. I will stay tuned (you are in my blogroll)! PS Just make sure you mush up the beans well, sometimes this is where some people go wrong and the final burger doesnt stick well, so mash, mash, mash. Waw!! 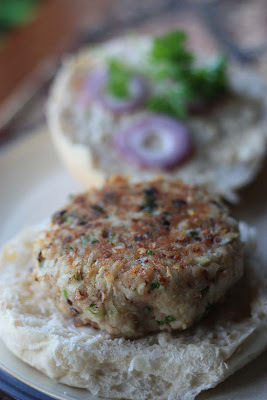 These burgers look extremely tasty & fab! Yummie,....!!! Thank you Sophie. They were good. I would certainly recommend trying them. They really were good, and I really enjoyed the kick from the horseradish. I love finding new combinations for veggie burgers! This looks like a great set of ingredients. That looks sooo amazing! I would never have thought of it. Thank you so much for you comment Collegian. I too would never have thought of adding celeriac to a burger. It is really good.